OK, I realize that an entry about booze seems out of place in my blog section where I focus on food for a better lifestyle. But one thing I firmly believe in, is to INDULGE as well. Everything in moderation; it's not like I'm saying to consume chocolate syrup and vodka for breakfast, lunch, and dinner! I stumbled across this recipe from G+; it popped up in my feed, and coincidently, my boyfriend had recently brought home a bunch of Girl Scout cookies, which included Samoas in the mix. I felt like it was my destiny to make this video and blog entry. - Put some chocolate syrup on a plate. - Twist the edge of the glass into the syrup coating the entire rim. - Then sprinkle coconut onto the glass into the syrup. - In a chilled cocktail shaker, combine all of the drink ingredients and then shake vigorously. 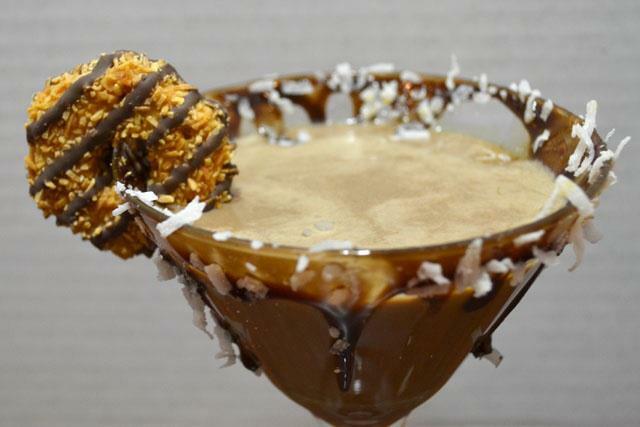 - Pour into the glass and then drizzle some caramel syrup on top of the cocktail and on the rim. - Garnish with a cookie.